Archive for the ‘Trip Reports’ Category. 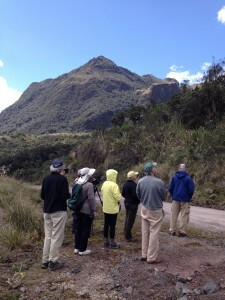 Walking to work today with a wind chill of -2°F certainly made me miss Ecuador, from which I returned on Monday. I spent ten days there with eight intrepid NYC birders who joined me as part of NYC Audubon’s international travel program. We visited both sides of the Andes, went as low as 500 meters above sea level and reached as high as 4,300 meters (over 14,000 feet) in altitude while visiting a variety of habitats from cloud forest to paramo tundra. We saw 221 species during our trip, including the majestic Andean Condor, the gorgeous Crested Quetzal, and the raucous Inca Jay. In addition, we saw a number of Neotropical migratory species such as the Blackburnian Warbler, Swainson’s Thrush and Spotted Sandpiper, a reminder of the incredible distances “our” birds travel during migration and a joyful promise that we’ll all be seeing them again in a few short months.